VOBS is pleased to announce Voyageur Start 2019! Voyageur Start is a bold funding initiative for our community, our youth and our young adults. Thanks to a very generous new funder, VOBS seeks to partner with Minnesota schools, colleges and youth-serving nonprofits to develop student leadership through experiential education. Who were the voyageurs? Hard-working, unconventional, bold and open-minded, these First Nation, Metis and French travelers navigated the waterways of Minnesota and beyond. They had a deep knowledge of nature and canoe craft, lived for adventure and had a culture and community all their own. Voyageur spirit is alive here at Voyageur Outward Bound School. While on trail, voyageurs had a tradition of launching their birch bark canoes in the dark, before first light. They wanted to travel farther and faster. This ambitious tactic is known as the “Voyageur Start,” and it is still practiced by our students. We want to go farther faster, together. We have ambitious goals to serve your students and to make a difference in our community. This is the spirit of Voyageur Start 2019. We believe everyone has a right to dream, to find strength and to succeed on their own terms. As you know, Outward Bound’s mission is to change lives through challenge and discovery. Our vision is a more resilient and compassionate world, with more resilient and compassionate citizens. We support students and their communities with ethical leadership and character development. Our students are crew not passengers and they learn by doing new and challenging things together, in urban and wilderness environments. We pursue shared goals. With Voyageur Start funding, VOBS aims to help organizations develop relevant skills for life in their students. Thanks to Voyageur Start, we will partner with more schools and nonprofits to serve social-emotional development goals and objectives for more under-resourced and diverse students in our state. Insight: eight monthly near wilderness full-day adventures that pair social-emotional skills with experiential challenges like, Rock Climbing for Responsibility, Canoeing for Communication, Orienteering for Goal Setting and more. We work with your team to identify the key student skills you seek to support in each program. Launch: eight monthly in-agency or in-school part-day programs that allow students to unpack their learning, stay on track and build community. 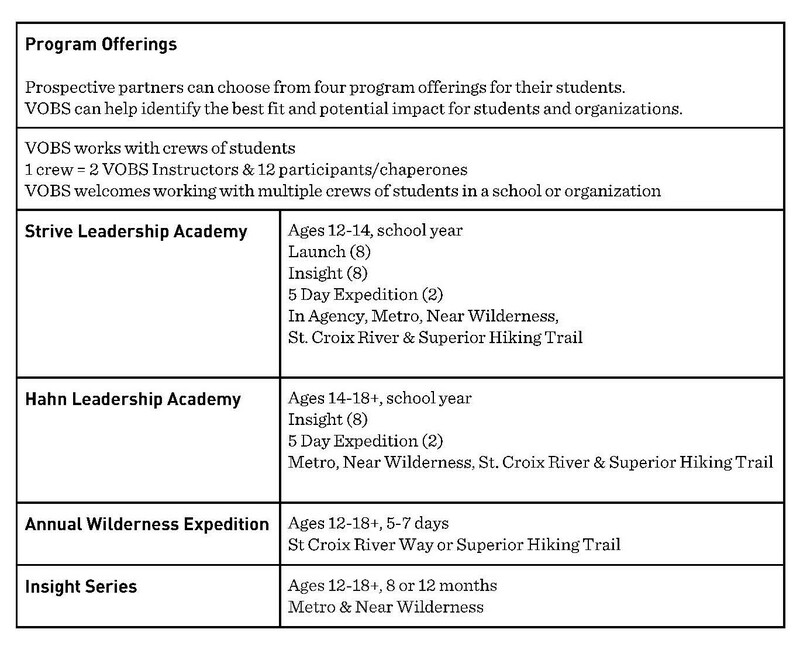 Expedition: two seasonal multi-day wilderness trips per year– fall, winter or spring– to set the tone for a year of learning, catalyze community, support key transitions or leverage a year of skill building. Insight: eight monthly near wilderness full-day adventures that pair leadership skills with experiential group challenges such as Rock Climbing for Interpersonal Communication, Urban Adventure for Asset Identification, Orienteering for Goal Management and more. We work with your team to identify key student skills you want to support in each program. For students ages 12 and up. Canoeing the St. Croix or Backpacking the Superior Hiking Trail. A 5-7 day wilderness expedition for specific grades or cohorts pursuing unique goals, such as AVID, JROTC, sobriety, leadership councils, athletic teams, clubs and more. Annual Expedition is positioned purposefully at a key moment in a year of learning– to set the tone for a new school year, catalyze community quickly, support key transitions or leverage and celebrate a year of skill development. For students who benefit from an increased sense of belonging and regular touchpoints with a consistent cohort of peers to share common challenges, build skills and reflect on learning. Our Insight Series is a progression of regular near wilderness full-day adventures that help students identify and grow personal and peer assets and strengths via experiential group challenges like, Rock Climbing for Comfort Zones, Urban Adventure for Collaboration, Orienteering for Problem-Solving and more. We work with your team to identify key student skills you want to support in each program. Voyageur Start will cover 50-80% of program tuition. This funding specifically supports diverse and under-resourced student populations in Minnesota. This funding supports students served by Minnesota schools, colleges and nonprofit programs. This funding supports students ages 12-18+. Propoposed programming must start in 2019. Current VOBS partners are encouraged to apply to fund new and additional programs at their organization (this funding does not support currently contracted 2019 programs). What type of organization you represent (school, nonprofit, college)? Which program you would like to apply for (Strive, Hahn, Expedition, Insight)? Complete & return application via email to marlais.brand@vobs.org by May 1, 2019. VOBS will contact prospective partners by May 15, 2019. I welcome questions by phone (651-401-0641) or email. Please share this new opportunity with your friends and colleagues. We look forward to serving your students! Marlais knows that challenge and adventure change lives. 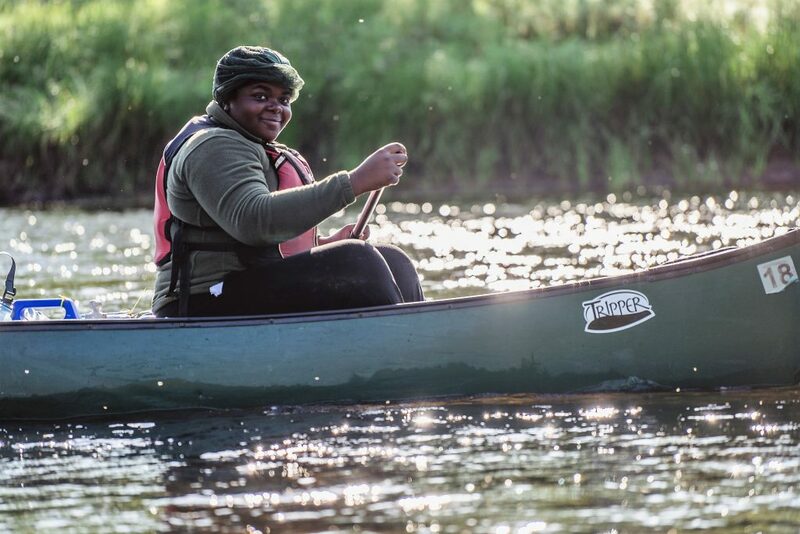 As Outreach Manager at Voyageur Outward Bound School, Marlais connects partners to the power of group learning and outdoor education. She teams with schools, colleges, nonprofits and businesses to put people on course for character and leadership. Marlais is an Outward Bound alum, teacher, trainer, writer and mother. She loves to travel everywhere, but considers Lake Superior her True North.